*We will consider a 3-night minimum stay for any remaining dates (except July 26-Aug 2). Please reach out if interested. Built in 2014! Yard updated in Dec 2018!! 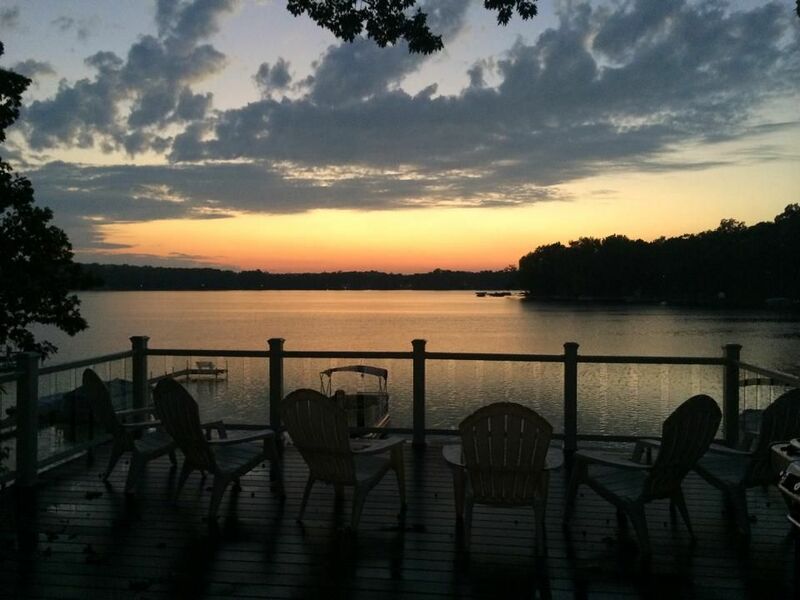 5 Bedroom, 4.5 Baths, Wet Bar, Screen Porch, Deck overlooking lake and large recreation room. Private 50ft of gradual sandy sloped beach on sandy bottom lake. Sleeps 15 comfortably. Deck: Overlooking the lake. Enjoy sunsets every night. Great Room: Queen sleeper sofa, Fireplace, Wet bar and beautiful picture windows overlooking the lake. Sleeps 2. Kitchen: A gourmet chef's dream with Subzero, Wolf and Bosch appliances. Recreation Room: Queen sleeper sofa with en-suite bathroom. Sleeps 2. Also use this area for air mattresses to sleep even more. Bedroom 1: Bunk room (twin over full with a trundle) on main level with forest view. Sleeps 3 to 4. Bedroom 2: Queen on main level with forest view. Sleeps 2. Bedroom 3: Queen on upper level with forest view. Sleeps 2. Bedroom 4: Queen on upper level with forest view. Sleeps 2. Bedroom 5: Master King suite with en-suite bathroom, crib and unobstructed view of the lake on upper level. En-suite bathroom has a walk-in glass shower, double vanity and separate water closet. Notice: Our house is on well water. We have a filtration system on the cold water in the kitchen. Also, our main water system has a water softener for interior water. We built our dream vacation home and want to share it with your family. Lake views from living/dining room, kitchen, screen porch, deck and master bedroom. Lakefront home with direct access to 50ft of private gradual sandy sloped beach. We suggest you bring your own beach towels. Basic Internet for checking email. Streaming or video not recommended. We had a wonderful time at this property and would definitely book again! We had kids ranging from ages 4-9 and they were all able to enjoy the lake. Unfortunately the water level was high so there was no beach, but the kids loved the water anyways! The kitchen was beautiful and the large dining table and screened in porch were both nice to have. Our only tiny issue was that they had work being done on the home when we arrived but had no warning that there would be workers there upon our arrival. We had to get in touch with the owners to make sure people were supposed to be at the house when we pulled up! (There were issues due to a lightning storm the previous night so we understood that the work had to be done, would have just liked a heads up!) The property manager was quick to respond which was very helpful. Our family really enjoyed our vacation here. The lake is clean and during the week it is very quiet. As the weekend approached more residents arrived but it was never crowded or disruptive. This is definitely a family friendly home and the owners furnished it with a ton of water toys, inflatables, and kayaks. The home was clean, well kept, and very comfortable. The fruit flies mentioned in other posts really wasn't a problem for us. We always sealed our food and took the trash out so no bugs were an issue. The owners, by far, are very professional and understanding, as well as responded to every question and concern promptly. We have used this website for the past five years and these owners are tops on the list. Very trustworthy, caring, and just overall good people. The only thing we could think of for improvement would be to add a bit more furniture throughout the home. We have a large family though (14) so for smaller families visiting this home it is just right. Thank you very much for allowing our family stay at your home, it gave us many pleasant memories. We couldn't have asked for anything more! Beautiful home, the outside was clean of cobwebs, etc., the inside was immaculate, cool a/c on when we arrived and kept us cool all night too. The water filtration system was great, beautiful view from the family room, and nice long dock. We did not need water shoes, since the bottom of the lake was mostly sand, with a few rocks. The screen porch was a great addition, along with the deck overlooking the dock and lake. The house had plenty of room for our large group, even a nice finished basement for an extra play room, and the kitchen was so easy for us all to cook in. They thought of everything. Plenty of dishes, utensils, knives, pots and pans, etc. I especially appreciated the large refrigerator. We would love to come back next year!!! This was a wonderful vacation place for a large family. We had 8 adults and 7 little ones. Leona was very friendly, easily accessible and responsive to any questions or concerned we had. The information about the property that we were given was very helpful. The home is beautiful, fully equipped with all you could want. The lake is charming and not too big, perfect for kayaking , tubing and water skiing! The kitchen , great room and screened in porch were wonderful when you have a large family. One thing to note is if you want to rent a boat, you should book way in advance to secure it. And I highly recommend the water carpet. Our family all loved it, adults and children. The only downside this year, through no fault of the owners as it is Mother Nature,was that the sandy beach was submerged in water, so the little ones could not play in the sand and needed to stay up on the deck. And we were unable to have small bonfires on the beach. The owners said We could have moved the pit to the front driveway, but we were enjoying the views of the lake so much more that we didn’t want to move. Overall, we all loved this vacation home!! We had a family group which included 8 adults and 4 young kids (including a baby). The house was set up perfectly for our group. Its a perfect small lake for young kids, and the lakefront swimming area provided hours and hours of fun. The kitchen is beautifully updated, and the house is nicer than the pictures. There were also plenty of water toys both for the kids (buckets, shovels, floaties, etc.) and the adults (kayaks). The basement space is also a perfect play area for kids, giving them lots of room to have their own play space while adults are able to have their own space. The screened in porch is a very nice aspect of this house as well. The only downside to the trip was an errant smoke alarm battery that woke us up at 5am on our last day there, which was disappointing, but my best guess is that future groups will not have to worry about this now that it has happened once. Beautiful spot for our family! Easily accessible for all and a true diamond in the gem! Wonderfully kept and fully stocked!!! Our family of 8 adults and 2 babies had tons of space and plenty of fun for our wide range of ages. The Mote's did a great job in designing and decorating the home. Also, if you've not been to this lake, we recommend paddle boarding, kayaking, jet skiing, and relaxing on a lily pad/water carpet over renting a pontoon or a ski boat. The water is smooth and is small enough to paddle and kayak anywhere on the lake.